Eggplant and portobello mushrooms are a perfect marriage. Throw in a bit of gorgonzola and some spices and you have a delicious meal. Yum! “Portobello mushrooms are rich in potassium, essential amino acids, and vitamin B. They are low in calories and fat-free, but a great source of protein which is why they are so popular among vegetarians. Eggplant is a species of nightshade commonly known in British English as aubergine and also known as brinjal, brinjal eggplant, melongene, garden egg, or guinea squash. As a member of the genus Solanum, it is related to both the tomato and the potato. Surprisingly, it is botanically classified as a berry with its small edible seeds”. (Wikipedia) Who knew? Wipe mushroom caps clean with a damp papertowel. Do not immerse mushrooms in water as they will get waterlogged. Remove stems, chop and set aside. 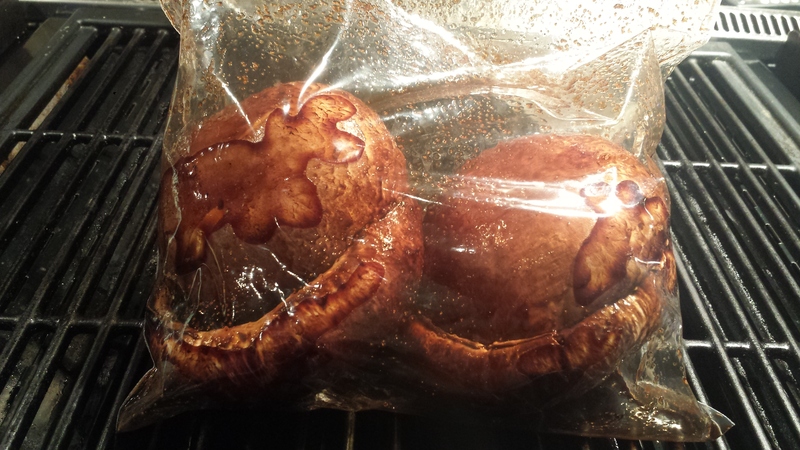 Combine the balsamic vinegar, garlic powder, and onion powder together in a large resealable plastic bag. Add mushrooms, seal bag turn until mushrooms are evenly coated. Refrigerate for 1 hour. Wipe eggplant dry, chop and sprinkle with salt. Let sit for a few minutes, until it sweats. Heat oil in heavy medium skillet over medium heat. Add onion, eggplant, and garlic. Sauté until onions are translucent and eggplant is soft, about 5 minutes. Add tomatoes and mushroom stems and cook another 2 minutes. If you are using canned tomatoes, drain and reserve juice for another use. Remove from heat; stir in Gorgonzola cheese and 1 tablespoon basil. Season with salt and pepper to taste. Toss ingredients with your favorite vinaigrette. 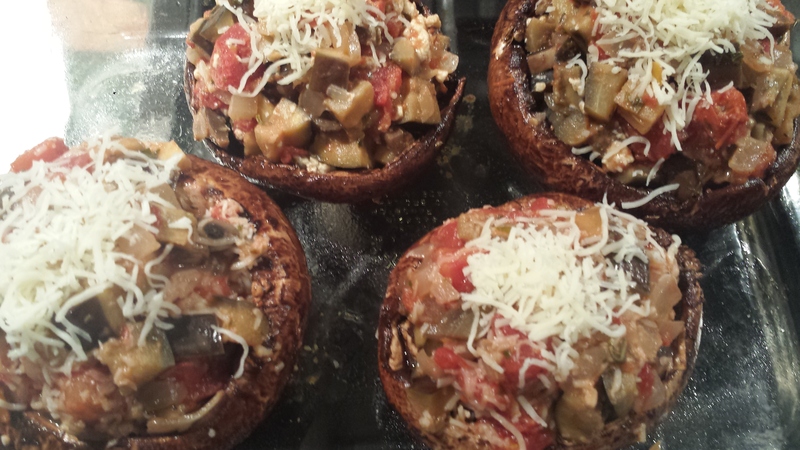 This entry was posted in All Recipes, Meatless Monday, vegetarian and tagged Eggplant, gluten free, portobello mushrooms, vegetarian, Wheat Free. Bookmark the permalink. 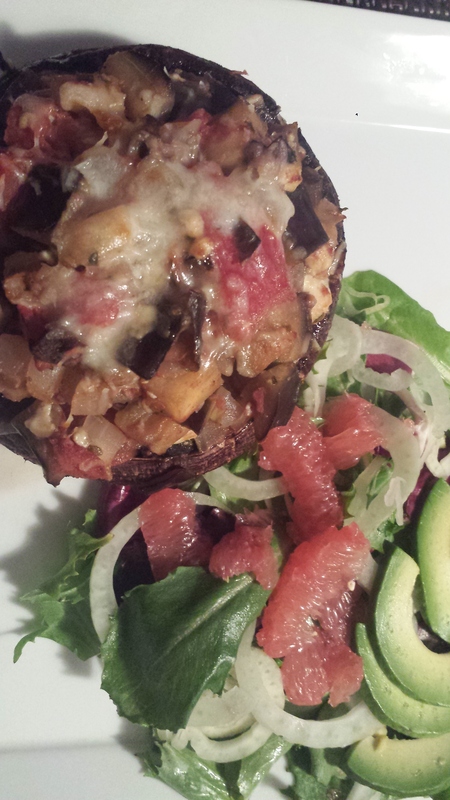 Stuffed mushrooms are a perfect vehicle for stuffing! I love making them as a vegetarian option for me and my mom! What are your favorite ingredients for stuffing? Thanks for the shout out! Enjoying your blog. I can’t stomach synthofood either, plus it would hurt the cattles feelings. Veggie burgers should taste like veg ! I’m working on bread, using only wheat, water, salt and sourdough. Barbara Sherman – Paul Vandenberg Paradisos del Sol Winery – The Farmery paradisosdelsol.com – 509.829.9000 Come Taste Paradise! Searching for a recipe with portabella much rooms and eggplant and your page came up…Trying it for the first time. It looks and smells amazing… Oh and to change it up just a wee bit I added basil to the mixture instead of on top and added the rest of the balsamic mixture to the dish while it cooked… OMGOODNESS! It’s YUM! Stacy. I’m so glad you liked it. Love the suggestions too. Thanks for the feedback!